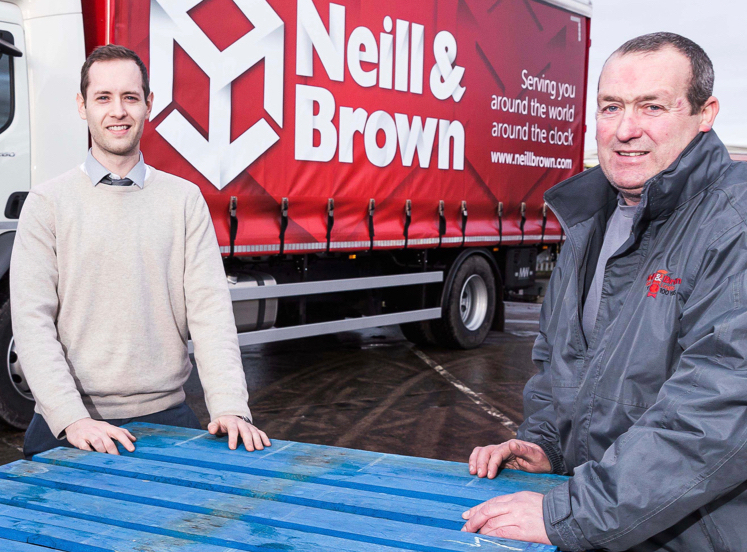 Neill & Brown Global Logistics is trucking more palletised goods than ever before after joining the UK's fastest-growing distribution network. Its drivers now deliver cargo to the Pall-Ex hub in the Midlands, for onward distribution throughout the UK and Ireland, returning with consignments for the Hull postcode area. A range of vehicles is employed on Pall-Ex work, from articulated lorries to rigid tail-lift vehicles and vans for harder-to-reach locations. The latest, an 18-tonne rigid, supports the ever-growing requirement for collections and deliveries in the local area and is among the first group of vehicles to carry the company's new livery and logo. "After celebrating our centenary last year, we are making statement of where we are today by bringing in a clean, modern look which will stand out within the business and be distinctive on the road," said chief executive Peter Brown. Logistics director Carl Andrew said that working with Pall-Ex further enhanced Neill & Brown's UK capabilities by offering cost-effective logistics solutions for the company's local client base and wide-ranging European network. The relationship with Pall-Ex has taken the total number of pallets handled at the firm's depot at Hessle, near Hull, to around 2,500 a week and has also led to Neill & Brown winning the award for best new depot of 2017 after joining the network last May. “We’re pleased to be playing our part in Pall-Ex achieving high levels of efficiency and that our efforts have been recognised in their annual awards,” Mr Andrew added. Pall-Ex, whose distribution hub is at Ellistown, Leicestershire, says that by uniting independent haulage companies to work together cooperatively in a network it has introduced substantial operating and trunking efficiencies.